Now, call us "Messrs Cynical" if you must, but we suspect that Government Departments and the Honours and Decorations Committee will endeavour to present to an unsuspecting public their view of what the PJM means - a view that endeavours to support the shameful recommendation of the British Honours and Decorations Committee that divides the Commonwealth and that reduces the honourable PJM to the level of a worthless trinket. 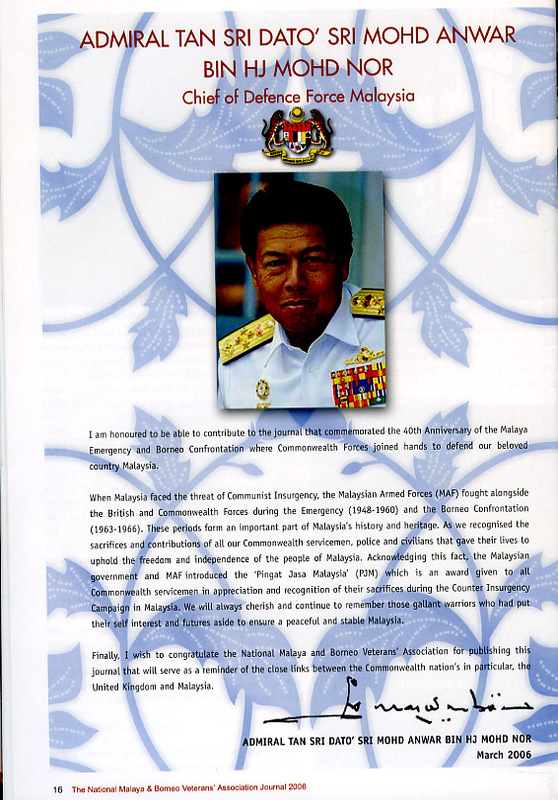 The PJM is a Malaysian medal and it acknowledges a period in their history that is very important to them. It is also very important to those of us who served with that gracious nation to overcome terror and aggression. (*)The Commemorative Journal is a must read. This page is an excerpt and is copyright Horizon Publications Ltd.
"The wearing of non-British awards is not policed, and no law is broken if an individual wears such an award, even though official permission to do so may not have been given. It is a matter for the individual concerned whether they wish to wear the PJM on this basis"
Do I interpret this as saying, " go ahead and wear it if you want to, but I never said you could"? Another case of Whitehall Fudge it would seem.